I do think the colors seem to be pretty close. Coral Fever is a balanced coral with both peach and neon pink tones, a bright, melon-y coral. It has the brightness that I’ve admired in pictures of Estee Lauder’s Coral Cult. So I think that I can safely skip Coral Cult. 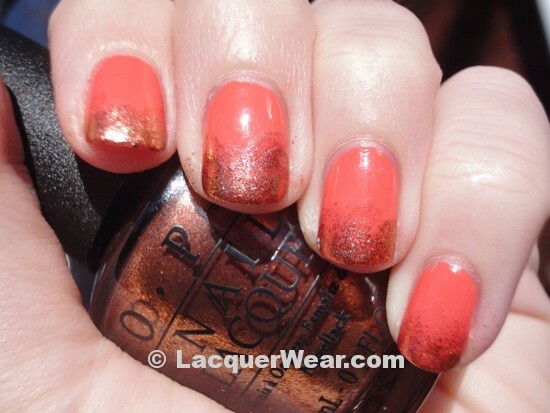 The picture shows three coats of Coral Fever and topcoat. The formula on Coral Fever isn’t perfect, and is a bit streaky at first, but after three coats it looks ok.
After a couple of days I sponged OPI Sprung along the bottom of my nails. This combination made Coral Fever seem more orange, and the whole thing sort of reminded me of the flames on the old Hot Wheels logo. I liked that the coppery flash of Sprung played off Coral Fever and coordinated. The sparkles in Sprung are so pretty! You can see both a coppery gold and a pink flash in the sunlight. 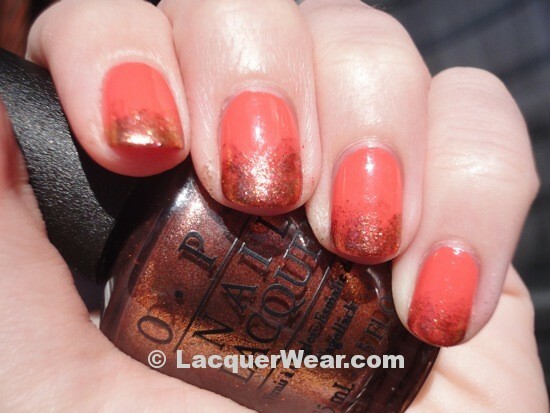 OPI Sprung is part of the OPI Mariah Carey Collection and is out in stores now. 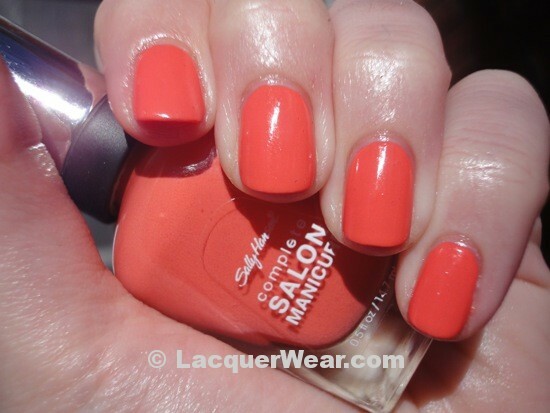 Sally Hansen Coral Fever was a Sally Hansen release from summer 2011. I reviewed it here, and you might still be able to find it online. Cool mani! I’m actually wearing the Estée Lauder Coral Cult on my nails at the moment and I would have to agree with you that Coral Fever is almost identical. Thanks for the swatch!